Appliance Repair Service of Bradenton. Professional workmanship, friendly people, affordable prices. Serving Bradenton and surrounding communities. Immediate refrigerator repair. Same day service on all appliance brands, gas and electric. Immediate service for refrigerator repair. Fast same day service for washer, dryer, oven, dishwasher, water heater, ice maker, and microwave repair. Call Appliance Repair Service of Bradenton to speak with a live operator. We’ll have an appliance repair man on his way within minutes! Service within minutes, not days! 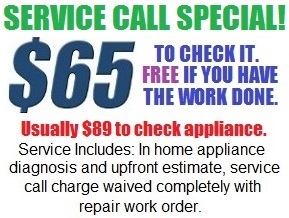 Coupon Special-$65.00 Service Calls ($89 value), FREE if we do the job. Since 1978, we have been providing quality appliance repair service to our customers. Our staff is polite, careful, and on time. We practice care and courtesy while servicing your appliances to insure that you and your home are always respected. We are punctual and mindful of your schedule and put a priority on being on time. All of our technicians are skilled professionals and have been repairing appliances for years. At Appliance Repair Service of Bradenton appliance repair service is all we do and we have what it takes to get your machine repaired quickly and operating like new again. Expert Service on: Whirlpool, Sub Zero, GE, Frigidaire, Amana, Sears, Kenmore, Kitchen Aid, and all other brands. Thank you from Appliance Repair Service of Bradenton! Most of us can’t imagine our kitchen without a working refrigerator. Or our home without a properly working washer and dryer. But one day any appliance can break down. The refrigerator door will not close properly. The freezer is not cold enough. The refrigerator is too warm and the food goes bad. The washer wont drain or washer won’t spin. The dryer wont tumble or the dryer wont heat. The microwave won’t heat. In that case all there is left to do is to call the repair guys to fix it. If you live in Bradenton, Cortez, Anna Maria Island, Bradenton, Bradenton Beach, Holmes Beach, Lakewoood Ranch, Longboat Key, or anywhere else close by and you need your refrigerator or appliance fixed, you can call us anytime of the day. We’ll come the same day or next day and fix it right away. Or if your machine needs a new part we’ll order and install it for you. Before calling us try to find out what brand is your applince and what’s wrong with your appliance – examples, ge refrigerator stopped running or frigidaire refrigerator not running, whirlpool refrigerator not cooling, whirlpool refrigerator clicking, sub zero refrigerator not cooling, ge refrigerator clicking, kitchen aid refrigerator leaking water, sears washer won’t drain, whirlpool washer won’t spin, sears dryer won’t start or roper kitchen aide dryer won’t tumble. GE whirlpool ice maker not making ice. Amana washer, dryer, or refrigerator noisey. GE microwave not heating. whirlpool kitchen aid or ge dishwasher won’t run, or ge frigidaire oven not baking. If the appliance seems to be not working, check the light or sound coming up from the machine. Check if the outlet is working well and the power is getting to the appliance. To do so, plug in a lamp or other device to the same outlet. If the power is not the problem, on a refrigerator there is most likely something wrong with wiring, thermostat, fan motor, defrost timer, compressor, overload or relay. On a washer the pump, belt, lid switch, spinning, draining, or timer could malfunction. The dryer belt, squeaking, motor, won’t start, not heating, not turning, not running, too long, or not starting. Water heater runs out of hot water too fast, or not heating water. Ice maker no ice or makes icicles, leaking. Dishwasher won’t drain or won’t run, or dishwasher door is too heavy. Oven won’t bake, or won’t come on. Stove or cooktop no heat or light stays on. Any machine showing fault codes F followed by a number. First write down the fault code, it will help the technician know how to repair the problem. Then try to reset the machine by disconnecting the power for five minutes. Sometimes the controls will reset. If the fault returns, then you would need to get professional help. In case your refrigerator is not cooling properly, check the thermostat knobs and set all controls to the mid setting. Also verify that the compressor and fans are running. Poor cooling is also often the result of a heavy frost build-up on the evaporator (cold) coils. A sure sign that there is a defrost problem is the presence of any frost or ice build-up on the back wall or sometimes floor of the freezer. The refrigerator is supposed to self-defrost. Failure to defrost causes blocking of the cold coil and poor cooling. You can try to defrost the refrigerator manually, but it’s very time consuming and messy. This will only temporarily fix the problem as the refrigerator has a totally automatic defrost, meaning the problem likely will return in a few days. A good option may be to call Appliance Repair Service of Bradenton at (941) 747-2600. 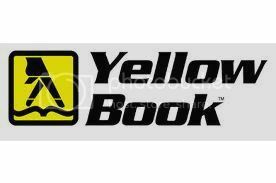 If you use the coupon, the service call is only $65.00 to diagnose the problem. If you decide to have the repair work done, then the service call is free.